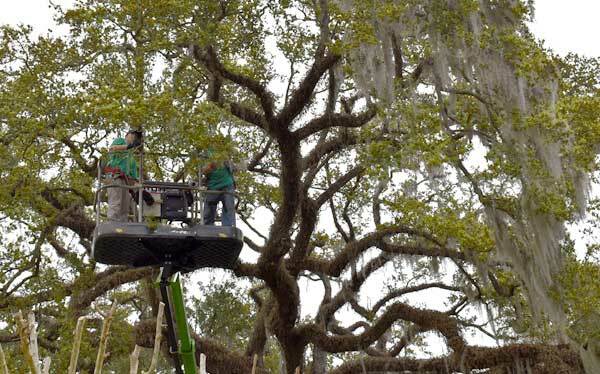 Professional de-mossing is the practice of climbing trees and physically removing the spanish moss. Spanish moss, (Tillandsia usneoides), is an epiphyte, cousin to such plants as the tropical orchid and the staghorn fern. Epiphytes derive their nutrient and moisture needs from the air; therefore they are not parasites, and they do not harm the trees. De-mossing should be done by a certified professional like Specialty Tree Surgeons because this process defoliates a fair amount of vital leaves from the trees. Some experts guess that as much as 30-60% of the foliage can be lost if this process is not performed properly. Some, less than professional, outfits will remove an entire limb of a tree to remove the moss. The key to a tree's health and longevity is its leaf population. The three main principles of tree preservation are 1) leaf population, 2) leaf population, and 3) leaf population! The more leaves in a tree's crown, the healthier the tree, and the less likely it is to be susceptible to damage from insects, diseases and—worst of all—humans. So, de-mossing can be dangeous to the trees health if not performed properly. We do not recommend spraying with sodium bicarbonate to de-moss. When properly applied, sodium bicarbonate desiccates the moss, and it dies on the tree. Over time, the elements cause the dead moss to fall from the trees. The results can be disappointing if the customer doesn't stick with the treatments for at least three consecutive years. Moreover, spraying without pruning can merely expose dead wood in the tree. Our approach to spanish moss management is quite different from commonly accepted practices, and is predicated on 2 important points. The first: Leave the foliage intact. If that means leaving a moderate moss population intact as well, then so be it. The second: properly maintained trees tend to self-manage their moss populations.